These maps show the predicted changes in wind speeds along the coast in April (above) and September (below). Images by M. Snyder. 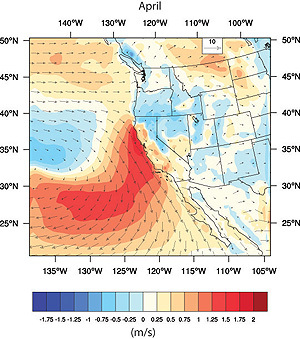 Future increases in wind strength along the California coast may have far-reaching effects, including more intense upwelling of cold water along the coast early in the season, "dead zones" in coastal waters, and increased fire danger in Southern California, according to researchers at the Climate Change and Impacts Laboratory at the University of California, Santa Cruz. Earth scientist Mark Snyder presented the findings in a poster titled "Future Changes in Surface Winds in the Western U.S. due to Climate Change" at the Fall Meeting of the American Geophysical Union (AGU) in San Francisco on Friday, December 19. 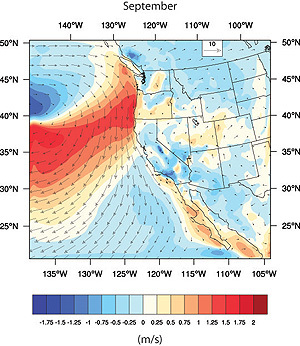 Snyder's group used a regional climate model to study how the climate along the U.S. West Coast might change in the future as a result of global warming driven by increasing atmospheric concentrations of greenhouse gases. The results suggest that a general increase in wind speeds along the coast is likely to accompany regional changes in climate. "What we think is going on is that land temperatures are increasing at a faster rate than the ocean temperatures, and this thermal gradient between the land and the ocean is driving increased winds," Snyder said. The researchers conducted multiple runs of their regional model to compare simulations of the coastal climate for two time periods: 1968 to 2000 ("modern climate") and 2038 to 2070 ("future climate"). The regional model was driven by input from the global climate models used in the most recent report of the Intergovernmental Panel on Climate Change (IPCC AR4). The future climate projections were based on a "high-growth" emissions scenario (A2) thought to provide an upper range of possible future climates, although Snyder noted that recent global carbon dioxide emissions have exceeded even the highest projections of earlier IPCC reports. The results showed increases in wind speeds of up to 2 meters per second, which is a large change in relation to current average wind speeds of about 5 meters per second, Snyder said. One effect of these increased winds may be earlier and more intense upwelling of cold water along the coast. Upwelling is generally a good thing, bringing up nutrient-rich deep water to support thriving coastal ecosystems. But researchers think too much upwelling may be causing the massive "dead zone" that has begun to appear with alarming regularity off the Oregon coast. According to an earlier study by Oregon researchers, intense upwelling driven by stronger, more persistent winds stimulates excessive growth of phytoplankton (microscopic algae), which ultimately sink to the bottom and decompose, sucking oxygen out of the bottom waters. Snyder said these conditions may become more prevalent in the future, and stronger winds all along the coast may cause the Oregon dead zone to expand into California waters. Strong winds can also create extremely hazardous fire conditions, as was seen this fall in Southern California. On the positive side, strong winds would be good for the growing wind energy industry. Snyder also noted that an enhanced sea breeze during the warm months of the year has a cooling effect along the coast. Such a cooling trend could have many ramifications, particularly for coastal species adapted to seasonal changes in temperatures and fog, he said. Snyder's coauthors are graduate student Travis O'Brien and Lisa Sloan, professor of Earth and planetary sciences and director of the Climate Change and Impacts Lab. Note to reporters: You may contact Snyder at (831) 459-3504 or msnyder@pmc.ucsc.edu.